Installing a new countertop but not sure what kind to choose? Want to know the proper way to clean your current countertop's surface? Here are pros, cons and cleaning advice for all types of kitchen countertops. There are general practices that apply to all countertops. Many counters are not entirely heatproof so be careful about setting down hot pans without a trivet. Most counters will chip or dent if they are hit with a heavy object. Sharp objects can damage the surface so do your chopping and dicing on a wooden or plastic chopping board. Ceramic tiles come in every colour and many designs. Pros: Glazed tiles will not stain or scratch. They're easy to install, even for a do-it-yourselfer. Repairs are easy and inexpensive. Cons: Ceramic breaks easily and grout provides gutters for dirt. 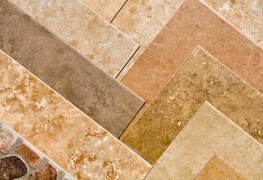 Grout will stain if not sealed and maintained. Ceramic tile ranges from inexpensive to moderately expensive. Cleaning: The grout can stain if it isn't sealed properly. Clean with a solution of 125 millilitres (1⁄2 cup) liquid chlorine bleach to one litre (one quart) of water. Made of hardwood, a butcher block is very warm and attractive. Pros: A butcher block countertop is easy to install and can be repaired easily by sanding and resealing. Cons: Butcher block burns, scratches and dents easily. It needs to be treated regularly with mineral oil or wax, or to be sealed with a polyurethane sealer. The joint between countertop and backsplash must be caulked to prevent seepage. Cleaning: Clean butcher block counters with a sponge dipped in a mild solution of dish detergent and water. Condition the wood regularly by sealing it with beeswax or apply a thin coat of mineral oil when the wood begins to look dull. 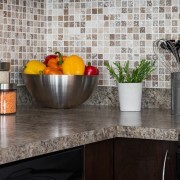 Solid surface countertops come in dozens of colours and patterns. Pros: Scratches and nicks can be easily buffed out with an abrasive pad. It can be installed without seams and can include sinks and a backsplash. 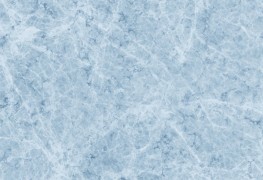 Cons: A solid surface countertop is easily scratched, can be discoloured by heat and requires a trained installer. It's moderately expensive. Cleaning: These countertops are synthetics that emulate marble or natural stone but are easier to clean. After each use, simply wipe down a solid surface countertop with a sponge and a weak solution of dishwashing liquid in water. Pros: The least expensive of all countertop materials, laminate can be installed by an experienced do-it-yourselfer. Cons: Nicks and scratches are readily apparent. Will burn and scorch. Has visible seams, which can allow water and grime to get under the surface. Caustic cleaners or drain openers can discolour the surface. 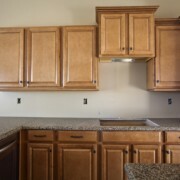 Cleaning: Wipe laminate countertops with a mild cleaner, such as liquid dish detergent and water. 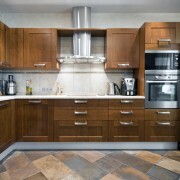 Avoid using abrasive cleaners or those that contain agents that could discolour the laminate. Some stains require more elbow grease. Cover the stain with a thick paste made of lemon juice and baking soda. After letting the paste dry thoroughly, rub vigorously with a damp cloth or sponge. This is the most popular natural stone used for kitchen and bathroom counters. Pros: It is very strong and durable, resisting scratches and nicks. Granite that has been sealed resists stains and cleans easily. Cons: Granite is heavy and requires a strong base. It must be custom installed, and a protective, penetrating sealer must be applied periodically for stain protection. Granite is expensive. 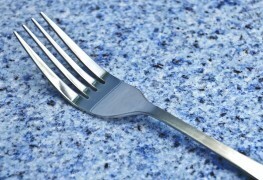 Cleaning: For everyday cleaning, wipe down granite with a damp cloth. To remove stains, make a paste of whiting (calcium carbonate, found wherever silver polish is sold) mixed with a little hydrogen peroxide and ammonia. Let it work for an hour or two, then wipe it away. Choosing and maintaining the right countertop can be difficult. Make it easier on yourself by considering these tips and understanding your options.